A Decent LED Light, with lots of power, for less than $40? Yes. 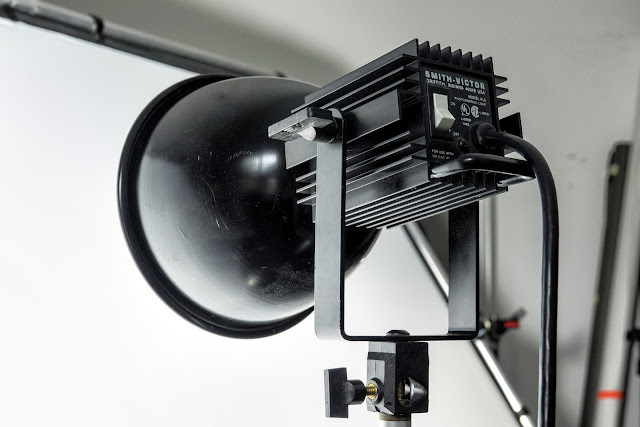 Most photographers probably have a fixture like this sitting around the studio. fixture probably burned your hand and you haven't used it since. I found a new use for mine. It's called, "LED bulb." Yesterday afternoon I was at Precision Camera, looking for a short, coiled XLR, male to female cable. I wanted a one foot, coiled cable that I could use to connect a microphone on top camera to the little mixer box bolted below the camera. Yes. They have one in stock. So I made that purchase and then, since the weather was bad and I'd driven such a long way, I decided to do a quick loop around the store to see what might be new. I played for a while with one of the new, Hasselblad, mirrorless medium format cameras, and I spent some quality time with a dedicated video camera I'm considering buying for an upcoming project. I played (for the fifth time...) with a Fuji X-Pro-2 but just couldn't summon up the right buying impulse. Too much cash to be spending on myself just before the holidays. But I did come across something very interesting on one of the less visited shelves, hidden in the valley of shelves which is the in-store district of camera bags, soft boxes, pop-up reflectors, Pelican cases and all the other stuff that isn't cameras and lenses. 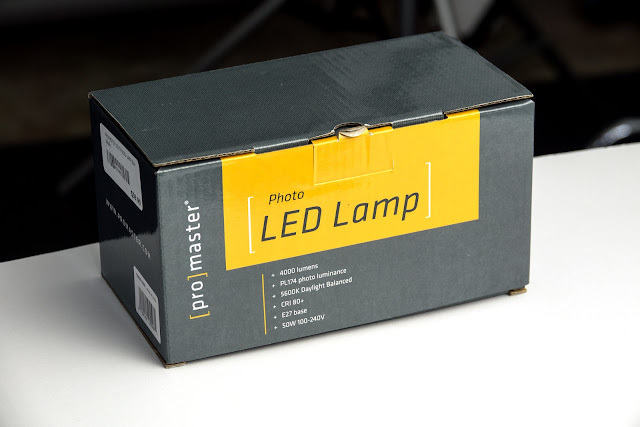 What I found was a bunch of boxes from Pro/master that were labeled "LED Lamp." There were several sizes and, of course, I was interested in the max output. I asked my favorite sales associate his thoughts about the product. "It's a high output LED bulb that fits into a standard household socket. It's really bright! But I'm not sure how color correct it is..." He said. He had me at "really bright." I bought one for the princely sum of $39.95. A few things to know about this product. If you want a bright LED source to shoot stills with and you're buying your coffee at McDonalds because the $1 price special is very, very meaningful to you, then this might be the best product out there to give you a lot of relatively clean light for a cheap price. You'll have to add the fixture but you can always buy a clamp light fixture at a hardware store for less than $10. The LED bulb is a 50 watt unit and it puts out at least as much power at the RPS CooLED 50 watt SMD unit I've been using for the last year. The big, white part behind the bulb itself is the self contained ballast and it IS fan cooled. The fan is louder than the fans in my RPS lights so I wouldn't recommend using it to record video with sound in a small, quiet room. But if your usage is for regular photography then you're set. 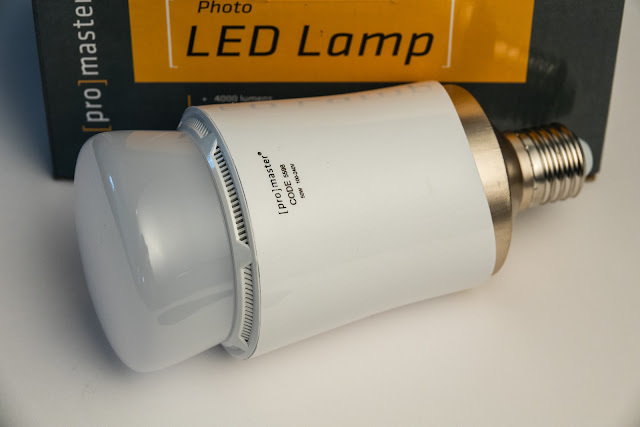 The bulb sits very forward in most fixtures because of the length of the ballast and fan assembly but the dome on the front does a good job of diffusing the light and spreading it around. For critical containment of light spill I'll just grab some Black Wrap(tm) and fashion my own flexible barn doors for it. 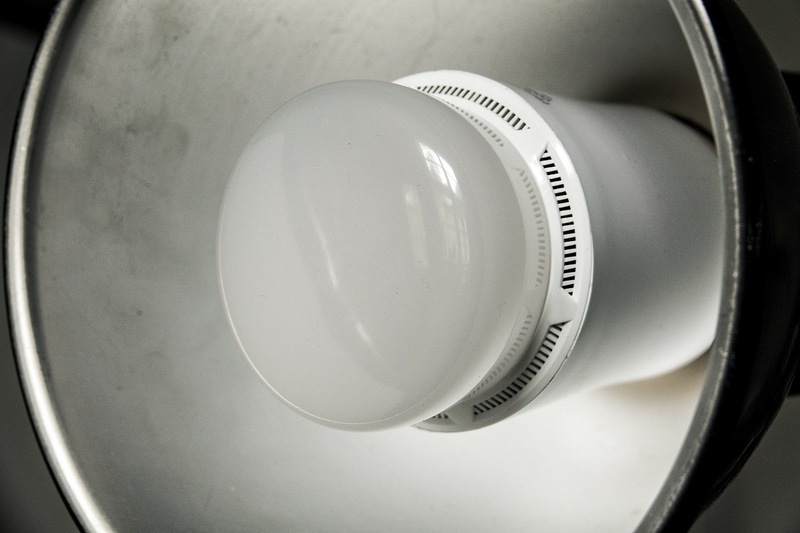 The unit gets warm to the touch on the front of the bulb and hot to touch on the ballast as it operates. Wait a few minutes for it to cool down before removing. The business end of the bulb. See the vents for the forced cooling? Here's one angle of the project. Preset WB to Sunny symbol. Eye dropper light balance in levels in Photoshop CC. These LED lamps are pretty interesting. Five years ago we'd have paid a lot more to get a lot less. What am I saying? 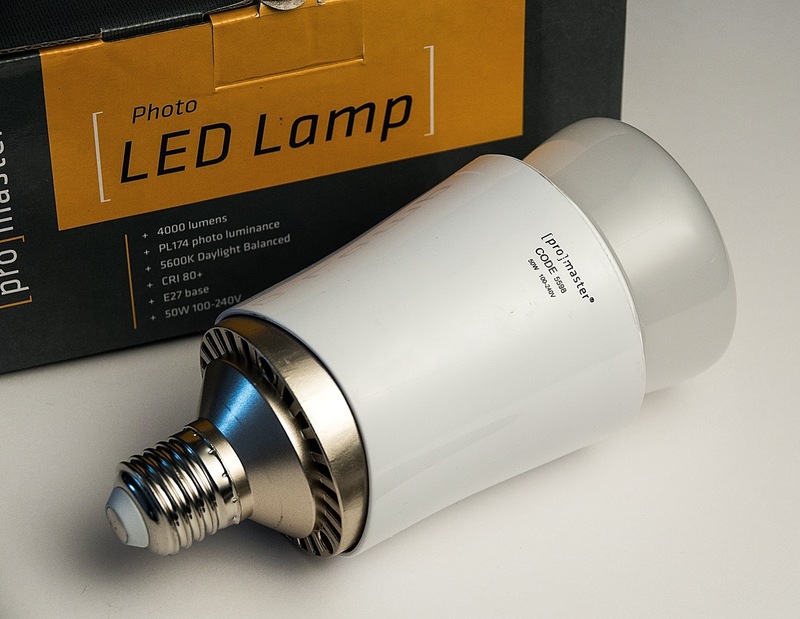 We did that... Now were able to get the equivalent of a 250-300 watt tungsten bulb in a form that's much cooler and more energy efficient, comes it at 5400K and is highly color correctable. For the price of a cheap fixture and the lamp. I put mine in the Smith Victor fixture that's lived in my equipment closet for 20 years and now I have another LED light to use around the studio. Right now I'm using it through a 3 x 6 foot, Lastolite aluminum frame with a 1.25 stop diffusion scrim. It looks beautiful. I like it. I bought mine at Precision-Camera.com but you can also get them from Amazon.com. Budget lighting at its best! 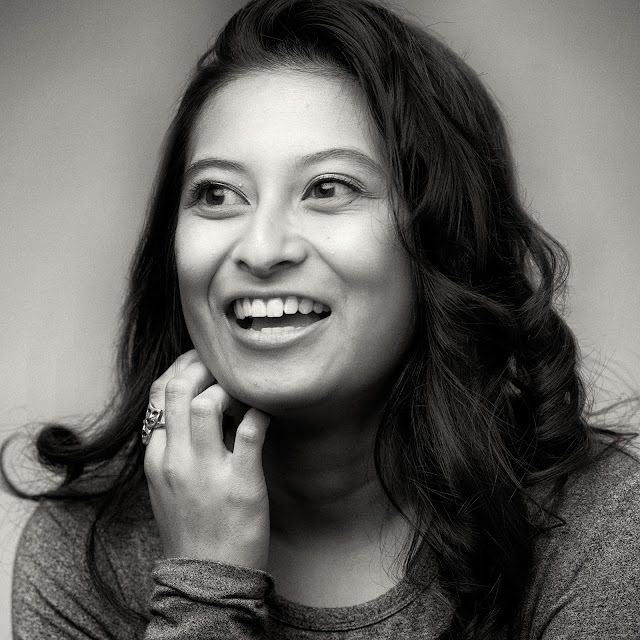 Portrait sessions follow their own pathways. If you are doing it right everyone is happy. Some photographers I know get really, really anxious when they are called upon to do portraits. They fret about the camera gear they might use. They obsess about what lights to use, how to modify them, where to put them and how to make them all work. When actually in session they become weighed down by the hoary traditions of "posing" and the conventions of "head tilt" and hand placement. With all these subroutines rolling around in their brains one wonders where the joy is in doing a session.